Cats & Dogs Unite with a Gold Out as the Football Teams fight for the Golden Spike. The annual Dunwoody High vs Chamblee High Football game is always memorable but this year there is a special purpose that these two student bodies are working together to fight and that is Childhood Cancer. If you are reading this and would like to do more than just buy a tee shirt, please donate here. 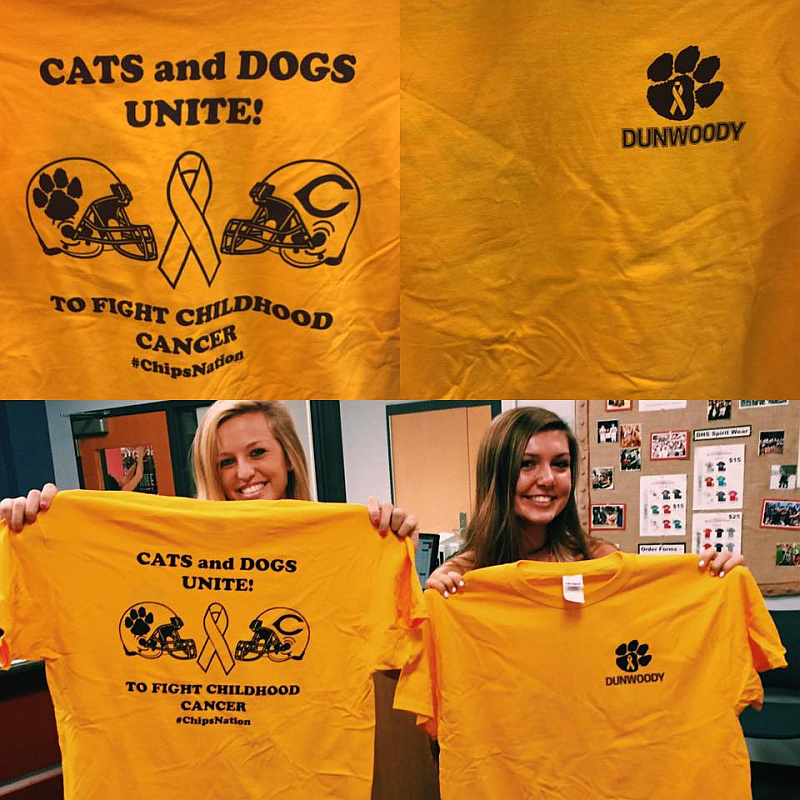 The shirts for the Dunwoody vs. Chamblee Gold Out game (9/2) for Chip's Nation are in! If you would like to buy a shirt and you do not have a student at Dunwoody or Chamblee, text/call Jenna Hogan at 678-736-9115 to purchase! The shirts are $10 a piece. Huffington Post - "A trip to Heaven’s gate and community love empowers 13-year old childhood cancer patient." Jaye Watson - Footsteps in the Sand. 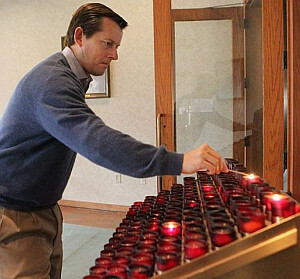 Scott Dockter lights a candle at All Saints Catholic Church in Dunwoody, Ga.
A simple request to pray for Chip Madren set Dockter on a new course. My kids love my never pass a children's lemonade stand rule because they know it's guaranteed liquid refreshment and if their lucky it also provides a cookie, but on top of everything it is also a life lesson for both my kids as well as the proprietor of the lemonade stand. One of our city's Girl Scout Troops is finishing up their Bronze Award by hosting a fundraiser this Saturday. They will be running a lemonade stand at the corner of Chamblee-Dunwoody Road and Chateau Drive (the entrance to Chateau Woods) to raise money for Alex's Lemonade Stand Foundation for Childhood Cancer. The girls were inspired to make Alex's Lemonade Stand Foundation the focus for their Bronze Award by former troop member Molly Kate Paris' cousin Mary Elizabeth Paris and her courageous battle against Acute Myeloid Leukemia, a diagnosis she received and from which she eventually passed away. September 2 marks the first anniversary of Mary Elizabeth's death, and the girls wanted to honor her brave struggle and donate funds to research efforts against blood cancers in children. The lemonade stand will run from 2:30pm-5:30pm THIS SATURDAY, August 27. The girls will be selling lemonade, cookies, scarves, and other items to raise money to donate to the Foundation. You can learn more about the work that Alex's Lemonade Stand Foundation for Childhood Cancer does by visiting the website below. Thank you in advance for supporting the girls, their Bronze Award quest, and most importantly, their fundraising for childhood cancer research. 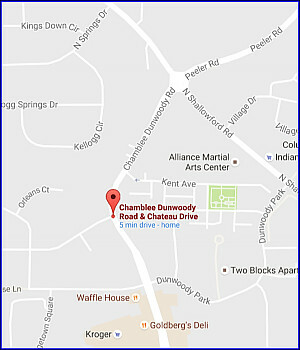 City of Dunwoody asks "What is a Conflict of Interest?" - get three opinions. Three legal memos outlining opinions on conflict of interest. During the August 22nd City Council meeting the City of Dunwoody released two separate city memorandums documenting legal opinions related to conflicts of interest of elected or appointed officials. As the Dunwoody Homeowners Association also hired an attorney to review the matter they also rendered a third legal opinion which I have included here in chronological order as it is also referenced in the City's latest reply. The first memorandum, dated June 6, 2016, is related to "Conflict of interests of officials and relationships with outsides agencies," and was submitted by City Attorneys Cecil G. McLendon and Leonid Felgin. This legal opinion was given to the City Council and City Boards and it is my personal opinion that it appears to be written with an extreme amount of caution in order to protect the city from even the appearance of undue influence. 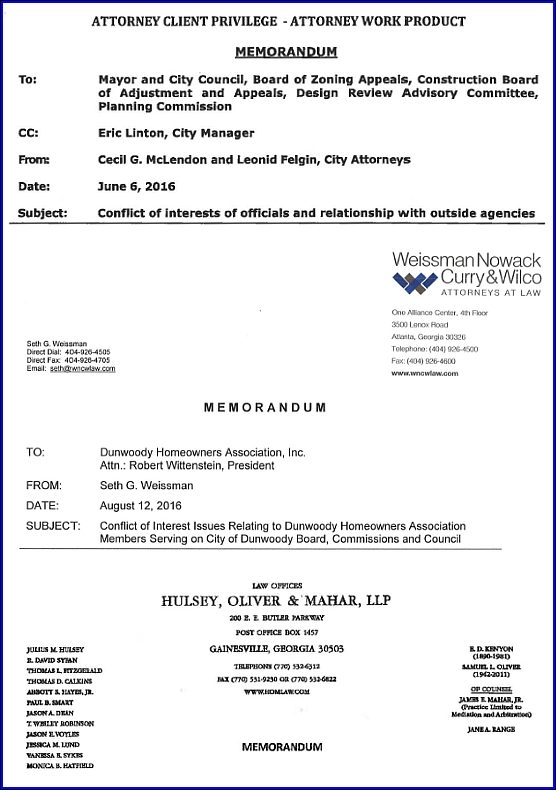 The second memorandum, dated August 12, 2016, is related to "Conflict of Interest Relating to Dunwoody Homeowners Association Members Serving on City of Dunwoody Board, Commissions and Council," and was submitted by Seth G. Weissman. 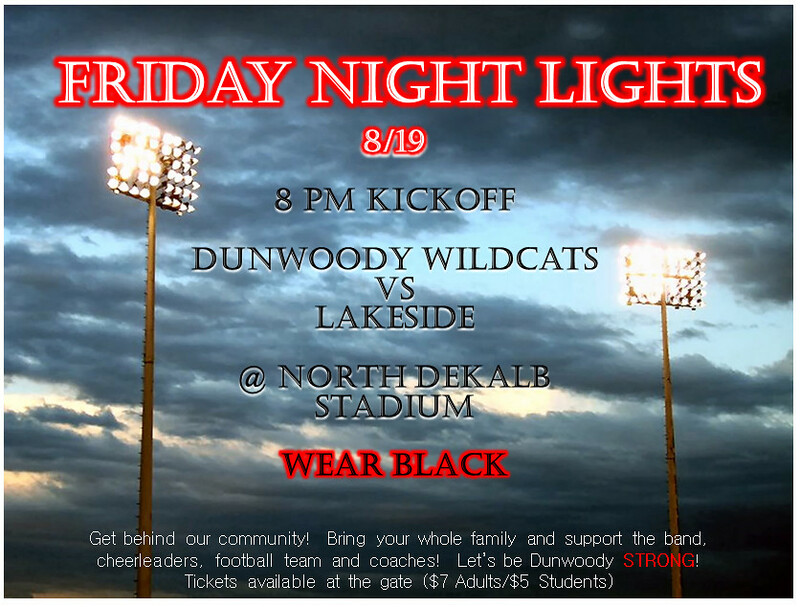 of Weissman Nowack Curry & Wilco Attorneys at Law representing the Dunwoody Homeowners Association. The third memorandum, dated August 19, 2016, is related to "Questions from City of Dunwoody re conflicts of interest," and was submitted by Abbott S. Hayes, Jr. of Hulsey, Oliver & Mahar, LLP who the Dunwoody City Manager recommended as an outside council to have another look at the subject. Besides possible conflicts of interest, this memo also explores the question to see if the privilege of Executive Session was abused or if the calling of this closed door session was improper. This attorney believes the use of executive session was proper in this case. I am not an attorney but I know that legal opinions are just that, opinions. Be they right or be they wrong, they are the opinions of legal training that I do not have, therefore I (as well as Council) may need to someday weigh the various opinions against levels of acceptable risk to make formal policy. Until that vote of Council happens, I believe there is no legal or ethical policy that I or anyone else related to the City is forced to follow on the subject therefore I will let my personal conscience be my guide as to what I consider an appropriate action for myself and I will need to live with my actions and/or suffer the consequences. As such, I plan to attend as many community meetings that my busy calendar can handle to be well informed on all items that may come in front of me, including the next monthly Dunwoody Homeowners Association Meeting on September 11th and then on Monday September 12th the Dunwoody City Council meeting where I believe the Mayor will be inviting outside Dunwoody Council Mr. Abbott Hayes to publicly brief the legal advice and opinions presented in the August 19th memo written on the subject. Join the Dunwoody Nature Center and Cox Enterprises for the annual Butterfly Festival this Saturday, August 20th beginning at 10:00 a.m. This year's event will feature two butterfly tents each filled with hundreds of live butterflies and activities including a 'Birds of Prey' show, live animal encounters, games, educational booths, crafts, music, food and more. Shuttles will run continuously throughout the day. Plan enough time to park, take the shuttle, pay your admission, and proceed to the “Tickets Purchased Today” Tent Entry wristband area. Purchases that are made on the day of the festival include entry to the butterfly tents on a first come, first served basis until we reach capacity. Please note: there is no parking at the Nature Center; plan enough time to park, take the shuttle and get your hand stamp and your Tent Entry wristband at the Tent Entry wristband area. We recommend a 30 min. lead time prior to your tent entry. Come early! There is plenty to enjoy throughout the day, both before and after your butterfly encounter, and you won’t want to miss a minute of the fun. Concessions? Of course! Have lunch, a cold drink, and some frozen treats with us—concessions are cash only. Also, don’t miss a variety of Games, Crafts, Live Music, Magic, Birds-of-Prey Show and Animal Encounters. • Games, Crafts, Live Music, Magic, Birds-of-Prey, Reptiles and Butterflies. We’ve got it covered! See you Saturday, 10:00 a.m. - 4:00 p.m.
Tickets purchased the day of the festival will be admitted to the Butterfly Tents on a first come, first served basis. Please note that in the event that the Butterfly Tents reach capacity, we will no longer allow entry to the tents, although you can still come to the festival to participate in our games, crafts, and other activities. Click on the links on the left tab to learn more about our activities, purchase tickets, download a festival map, a schedule of performers, concessions, parking and more! Resolution Appointing Members to the Board of Ethics. Resolution Appointing a Member to the Construction Board of Adjustments and Appeals. Resolution Appointing Members to the Urban Redevelopment Agency. SECOND READ: Consideration of Amendment to Chapter 8, Section 8-1(c) - PermissiveCodes, of the City of Dunwoody Code of Ordinances - Swimming Pools. Construction Funding Authorization for the Redfield Pedestrian Crossing. Resolution to Approve the Service Delivery Strategy with DeKalb County. SECOND READ: RZ 16-081: JK Family Trust, Owner of 1660 Mount Vernon Road,Dunwoody, GA 30338, by Dennis J. Webb Jr., Attorney for Owner, Seeks Permission toRezone Property Currently Zoned O-I (Office-Institution) District to CR-1 (Commercial-Residential Mixed-Use) District to Renovate the Existing Building into a Small ScaleShopping Center with Retail, Restaurant, and/or Office Use. SECOND READ: SLUP 16-081: JK Family Trust, owner of 1660 Mount Vernon Road,Dunwoody, GA 30338, by Dennis J. Webb Jr., attorney for owner, seeks a Special Land UsePermit for the following: a.) from Chapter 27, Section 27-97(g)(1) to allow the existing frontyard parking structure to remain as is; and b.) from Chapter 27, Section 27-97(i)(2) to reducethe 10-foot pedestrian buffer zone width along the abutting sides and rear of the building.The tax parcel of the property is 18-366-07-013. 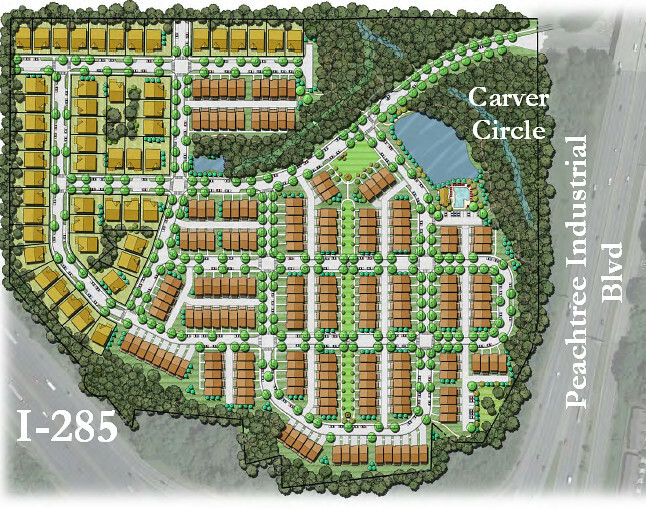 Doraville to hear proposal on Monday for 50 single family homes & 198 townhomes abutting Dunwoody. Flooding and traffic concerns are repeat items from 10 years ago. Carver Circle in the City of Doraville sits on 36 acres just above the intersection of I-285 and Peachtree Industrial and the only way to access the property is via the South Bound PIB access road just south of Tilly Mill. This property directly abuts the Broadstone (now called Dunwoody Village) apartment complex in Dunwoody and the Ridgeway / Van Fleet neighborhood of single family homes also in Doraville. The property in this little hidden neighborhood has been quite vacant for a number of years with many of the homes being purchased by developers. In fact ten years ago, when I was President of the Dunwoody North Civic Association there were plans to place 255 townhomes on the same property and my board raised numerous concerns including the possibility of increased neighborhood cut though traffic as the property is currently zoned for Chesnut Elementary. 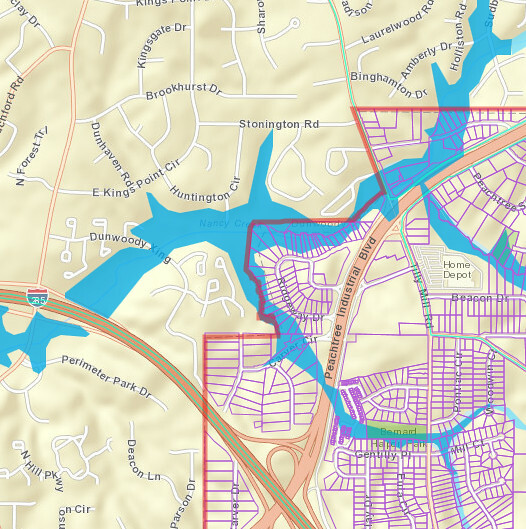 There was also a great deal of concern with the possibility of increased flooding into the Dunwoody North neighborhood as it appears that flood zones are being built upon. New Development in Flood Zones worries Dunwoody North neighbors. On Monday August 15th at 5:30 pm, the City of Doraville is holding a Public Hearing and possibly voting on the project. I have little other information at this time but hope to make it to Monday's meeting at Doraville City Hall. Z-16-08 for Carver Hills Neighborhood (outside of I-285) APPLICANT: Century Communities of Georgia, LLC. REQUEST: Applicant seeks to rezone 34 properties in the Carver Hills Neighborhood from the R-1 (Single-family Residential) district and the O-I (Office/Institutional) district to the Livable Community Code Special District (SD-2), sub-districts T-3 and T-4 for a new residential development comprised of 50 detached single-family homes and 198 townhomes. In reviewing my various news feeds, I noted a conversation happening on NextDoor regarding the numerous accidents happening on Mt. Vernon at Tilly Mill and in a related item the City just announced a public meeting to discuss proposed improvements to that same intersection whereby I believe the actions proposed by the city will mirror the items below that are quoted the the Comprehensive Transportation Plan. Mount Vernon Road at Mount Vernon Place: Prohibit left turn movements from Mount Vernon Place to Mount Vernon Road westbound. 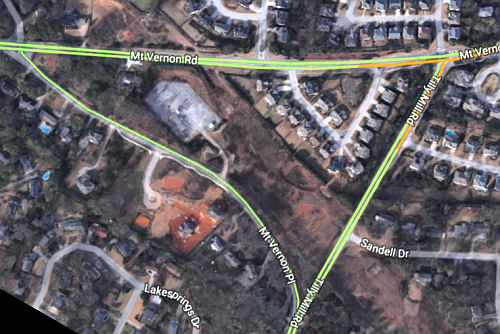 In conjunction with improvement at Mount Vernon Road and Tilly Mill Road. The City of Dunwoody will be hosting a Public Information Open House (PIOH) to collect community input and feedback on concepts for improvements to the Mount Vernon Road at Tilly Mill Road intersection. This intersection has been identified in the City of Dunwoody’s Comprehensive Transportation Plan as a high priority project due to its current poor safety and low level of service. This intersection and the surrounding corridors lack adequate turn lanes along Mount Vernon and have limited accommodation for non-motorized users. The goal of this project is to correct these deficiencies and improve the safety and operations of this intersection. The scheduled PIOH will look at the concepts currently considered. This open house event will promote participant interaction with city staff and their representatives. Attendees will have the opportunity to view the current concepts and provide feedback. The dialogue between the City and the public is critical to determine the best solution for this and other projects, so please plan to attend. The open house will be held from 6:00 p.m. to 8:00 p.m. on Tuesday, August 16th, 2016 at All Saints Catholic Church (2443 Mount Vernon Road in Dunwoody). If you are not aware of the NextDoor website, here is a registration link. 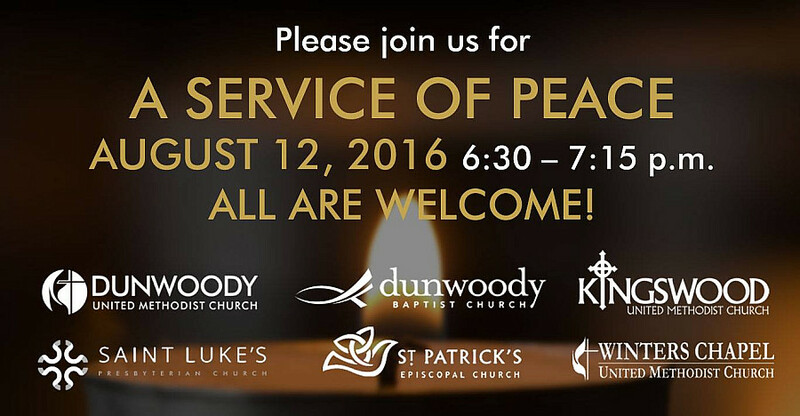 Coming together on Friday to express our commitment to be peacemakers in this community and the world. All are welcome! On Saturday, the community gathers once again at DUMC for Foodstock 2016 whereby 1,000's of meals will be boxed for those in need. Please join us by registering for a shift with your family. Lekotek Run 4 Kids is this Saturday Aug 13 at Dunwoody campus of Georgia State. Run to make a difference for children with disabilities. For the past 33 years, Lekotek of Georgia, a local non-profit has been helping children with disabilities and their families. Lekotek facilitates the inclusion of children with disabilities into their families and communities by loaning adapted toys, educational materials, computers and even iPads. These tools equalize the playing field making it possible for children with special needs to play and learn with siblings and peers. Computers and iPads are outfitted with appropriate software and applications to meet every child’s individual needs – whether the child has a visual or hearing impairment, autism, Down syndrome, cerebral palsy, genetic disorder or any special need. The Lekotek Run 4 Kids is gearing up for its 24th year. Its goal is to raise money for the non-profit so additional children can benefit. 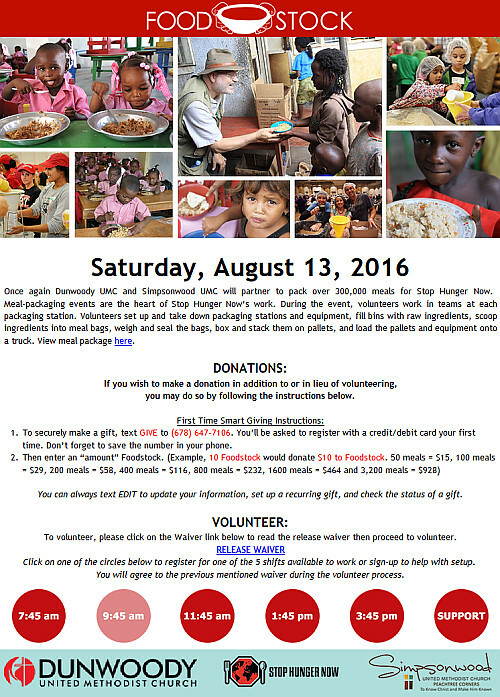 The event will take place Saturday, August 13th. Both the start and finish are at the Dunwoody campus of Georgia State University. The event courses provide options for every fitness level – a four-mile road race and walk and one-mile fun run. The four mile begins at 8:00 AM and the one mile at 9:00 AM. In addition to pre-race registration, runners can also sign up the morning of the event, beginning at 7:00 AM. The family friendly race is well organized, runner friendly, with refreshments and family activities following the run. You don’t have to an athlete to participate, just someone who wants to make a difference! The 24th Annual Lekotek Run/Walk will take place on Saturday, August 13, 2016. Register online at active.com until August 10th. $25 entry fee (Children under 12 years pay the dollar amount of their age.) by August 1st. $30 after August 1st and Race Day. Slow Down and be please patient in traffic with your neighbors who are adjusting to their new routines. Recognition of Sgt. Jason Dove, Sgt. Robert Parsons, Officer Nathan Berryman, Officer Michael Vermillion and Officer Guinevere Wiencek for Life Saving Measures. Presentation of Financial Report YTD June 30, 2016. 2nd Quarter Internal Audit Report. Convention & Visitors Bureau of Dunwoody Mid-Year Report. Ordinance to Execute the Financing Documents for City Hall 4800 Ashford Dunwoody Road. 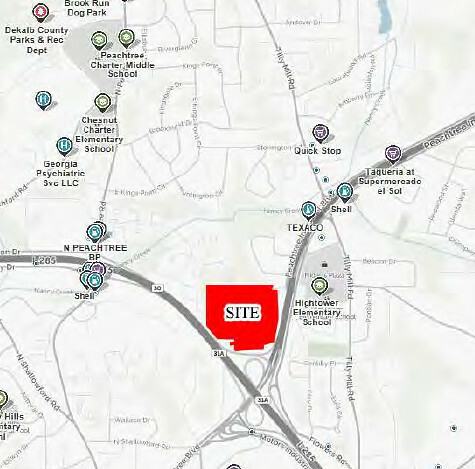 FIRST READ: RZ 16-081: JK Family Trust, Owner of 1660 Mount Vernon Road, Dunwoody, GA 30338, by Dennis J. Webb Jr., Attorney for Owner, Seeks Permission to Rezone Property Currently Zoned O-I (Office-Institution) District to CR-1 (Commercial- Residential Mixed-Use) District to Renovate the Existing Building into a Small Scale Shopping Center with Retail, Restaurant, and/or Office Use. FIRST READ: SLUP 16-081: JK Family Trust, owner of 1660 Mount Vernon Road, Dunwoody, GA 30338, by Dennis J. Webb Jr., attorney for owner, seeks a Special Land Use Permit for the following: a.) from Chapter 27, Section 27-97(i)(1) to allow for reduction in sidewalk width from 12 feet to 6 feet; b.) from Chapter 27, Section 27-97(g)(2) to allow the existing front yard parking structure to remain as is; and c.) from Chapter 27, Section 27- 97(i)(3) to reduce the 10-foot pedestrian buffer zone width along the abutting sides and rear of the building. The tax parcel of the property is 18-366-07-013. July 25, 2016 City Council Meeting Minutes. Resolution Appointing Members to the Alcohol License Review Board. Resolution Appointing Member to the Board of Zoning Appeals. Resolution Appointing Members to the Construction Board of Adjustments and Appeals. Resolution Appointing a Member to the Planning Commission. Resolution Appointing Members to the Sustainability Committee. FIRST READ: Consideration of Amendment to Chapter 8, Section 8-1(c) - Permissive Codes, of the City of Dunwoody Code of Ordinances. FOOD TRUCK LOVERS! Take a break from your first week of school and come enjoy an incredibly diverse line up of Atlanta's favorite food trucks! Josh Jeffords will also be providing entertainment up on the field! We can't wait to see you out there! 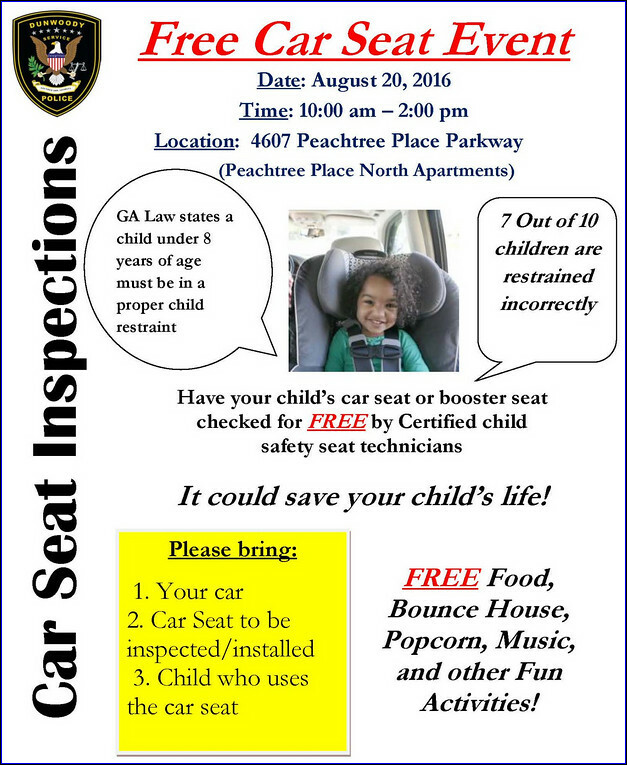 Dunwoody Police invites the community to Perimeter Mall for National Night Out to eat a hotdog in a SWAT truck. 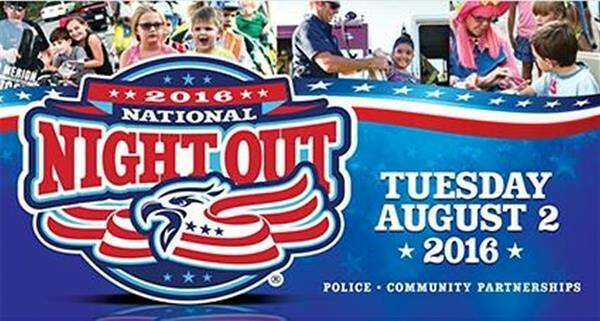 On Tuesday, August 2, 2016, Police Departments from the cities of Dunwoody, Brookhaven, Sandy Springs and Johns Creek will host the 33rd Annual National Night Out (NNO) event. On Tuesday, August 2, 2016, Police Departments from the cities of Dunwoody, Brookhaven, Sandy Springs and Johns Creek will host the 33rd Annual National Night Out (NNO) event. This community event will be held from 6:00pm to 9:00pm at Perimeter Mall, located at 4400 Ashford Dunwoody Road in Dunwoody. Sponsored by the National Association of Town Watch, National Night Out is an annual community-building campaign that promotes police-community partnerships and neighborhood camaraderie to make our neighborhoods safer, better places to live. The Dunwoody Police Department is proud to celebrate its 8th year participating in a community event that involves thousands of communities from all 50 states, United States territories, Canadian cities, and military bases worldwide. 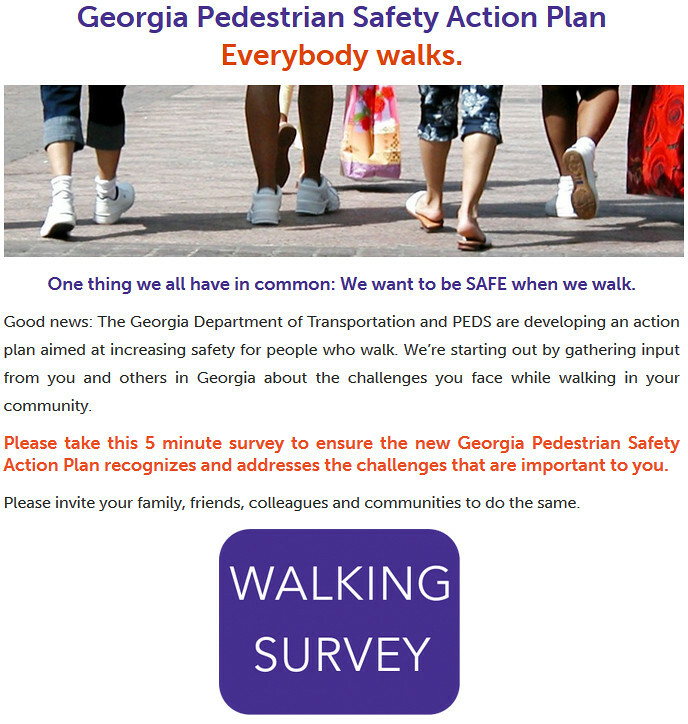 In addition to public safety organizations, many local businesses and community groups will have display booths set up, including the Chattahoochee River 911 Authority (ChatComm), the public safety answering point for 9-1-1 calls for the cities of Dunwoody, Brookhaven, Sandy Springs and Johns Creek. Music and entertainment will be provided, along with free food and drinks donated by many local stores and members of the community. This event will be a great opportunity for citizens to interact with members of the public safety community and with other residents. For more information about the 2016 National Night Out event, please contact the Dunwoody Police Department’s Community Outreach Officer, Mark Stevens, at (678) 382-6917 or at mark.stevens@dunwoodyga.gov. Dunwoody Football Coach Michael Nash discusses upcoming season, returning players and competition changes. 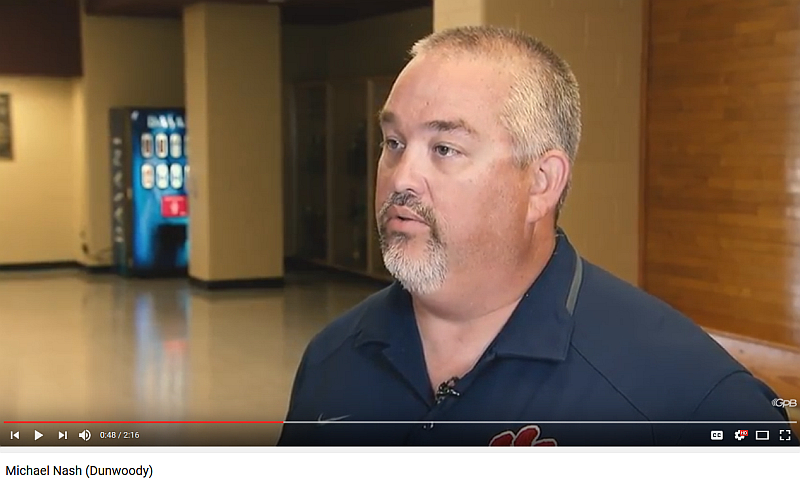 Coach Michael Nash discusses the upcoming 2016 Dunwoody High School Football Season, the returning players and the changes to the competition. National Poetry Slam in Atlanta this week reminds me of late nights in an Al Capone speakeasy. As a young man growing up in Chicago one of the interesting off beat places to hang on a Sunday night with friends was the Green Mill Cocktail Lounge, an old speakeasy operated by Al Capone whereby it was on those evenings that the jazz club was taken over by the Uptown Poetry Slam. Now in its 30th year, The Uptown Poetry Slam is the not only the longest running show in Chicago, but the original poetry slam on the planet. Every week, slam originator Marc Smith takes the stage with co-host, J.W. Basilo to bring a raucous performance poetry show to standing room only audiences. That’s right, what has been called “the most important literary movement of our time,” all began with one show and that show is still running every Sunday at the Green Mill. This isn’t your everyday poetry reading; the slam is an engaging, interactive, free-for-all that has to be seen to be understood. A live band sets the mood for the show and never fails to impress. The show begins with an open mic at 7PM and is followed by a “feature set” at 8PM, spotlighting some the hottest talent in the country. Once the crowd is good an warmed up, the world famous slam competition kicks off at 9PM with the crowd hanging on every word and ready to react with snaps and stomps if they don't like what they hear. I saw that the Green Mill is sending a talented team of poets to Decatur this week to compete in the National Poetry Slam and figured I would share the event for those who might be interested. 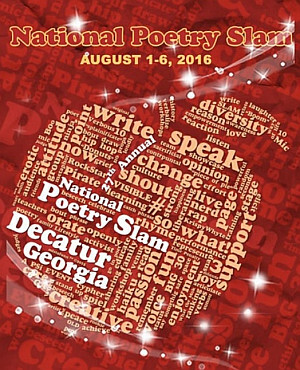 The National Poetry Slam is an annual poetry slam championship tournament where four to five person teams from all over the U.S., Canada and Europe gather to compete for the national team title and this year, it is taking place in Decatur. The week-long festival is part championship tournament, part poetry summer camp, and part traveling exhibition. 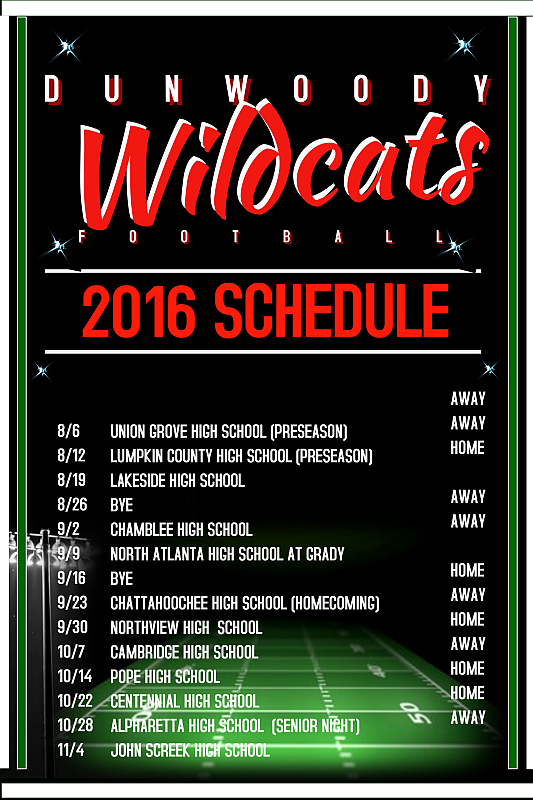 Click here for a full schedule of events and locations. The ribbon cutting ceremony will take place at the Decatur Visitors Center on Monday, Aug. 1, 7 p.m.